À 13 heures 26 mn ORDER, LIVRAISON AUJOURD'HUI. You know the situation: You don't know what to do with all your wheel sets, so you just throw it into your backpack. And all your (preferably white) cloths get oily and dirty because of the dirty bearings inside of your wheels! 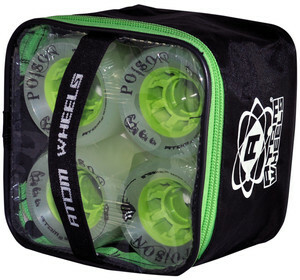 To solve that problem ATOM has invented this useful wheel bag. Made of a durable, nylon outer shell with a strong cloth handle and heavy-duty zipper, this handy bag will hold up to 8 wheels. The clear plastic top lets you see at a glance what you're packin'!